Do Some Dogs Like the Smell of Skunk Spray? Even if sprayed, if Scruffy keeps pestering those skunks by your property, could it be because he actually likes "eau de skunk?" A squirt of Pepe's "le pew" is all it takes to stop most skunk-chasing pooches in their tracks, but some dedicated dogs never seem to learn their lesson. Interestingly, though, dogs seem addicted to a certain type skunk smell, but perhaps NOT the type you would expect! The good news is that a skunk might not emit that rotten stink when you stumble upon him and he's not having a bad day. At least you have sense to back away. But your dog might not. Blessed with powerful sniffers, dogs are capable of detecting the skunk's typical musky odor -- not his defense odor, his body odor. While it's unknown if Scruffy actually enjoys a skunk's natural odor, the smell surely seems effective in stimulating his predatory drive. From an odorous standpoint, things change dramatically when the white-striped black omnivore start feeling threatened. In this case, a skunk will turn around and blast a powerful, foul mist often aimed at Scruffy's face. The dog's opinion about the skunk spray will be evident at this point. Most likely, he'll drop, roll on the ground, paw at his eyes and drool. The extremely foul spray acts like tear gas when it gets in Scruffy's eyes and may even cause him to feel queasy, explains veterinarian Cheryl Yuill. As if skunk spray weren't bad enough, there's a smell that can be far worst and dogs seem to just love it. Indeed, dogs love it so much they'll literally roll in it in total bliss, as if putting on a favorite perfume. In this case, you'll need to blame the smell of dead skunk. Not your ordinary dead skunk, but rotten dead skunk -- the riper and stinkier the better. As an added bonus, since skunks tend to spray during the final act of dying, Scruffy is liable to get skunk spray on him even from a carcass. Whether Scruffy loves or hates the smell of skunk, the worst part is that you'll be the one removing the stench from his coat. In this case, plug your nose and hold your breath. Skip the tomato juice unless you want Scruffy to smell like a rotten tomato: Contrary to popular belief, tomato juice doesn't work. Ask your veterinarian instead to recommend you a commercial product that neutralizes skunk spray. 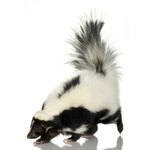 mypetED: What Can I Do if My Dog is Sprayed by a Skunk?